Stock recovery of the eastern Atlantic bluefin tuna has been confirmed by the International Commission for the Conservation of Atlantic Tunas (ICCAT) scientific committee, the Standing Committee on Research and Statistics (SCRS), resulting in a flood of bluefin throughout all the adjacent coastal and offshore areas of the Mediterranean Sea. The catch limit allocated to traps was soon filled and some 32,000 giant fish (roughly 7,000 tons) had to be released from Moroccan traps only. Aerial surveys witness a significant increase in juvenile bluefin and Japanese longliners have been enjoying good catches of medium and giant bluefin in the offshore Eastern Atlantic. On the other hand, the SCRS reports that from a precautionary view point it is not yet in favor of advising for an increase in the TAC since there remain several uncertainties in the stock assessments. Deviations between the fishing indicators and the stock assessment results have increased year by year in recent years and distrust of the SCRS stock assessments by the managers and fishermen has become more acute. There are several sources of the deviations but I would like to take one of the major factors, i.e., gross inaccuracy in the reported catch and the size of bluefin fished by the purse seine fishery for tuna farming in the Mediterranean Sea, and introduce recent ICCAT initiatives to overcome this problem by sequential implementation of the use of the stereoscopic video cameras (SVC) and improvement of its measurement accuracy. It has been widely known that the estimation of the total catch in numbers and size of bluefin has become difficult after the introduction of tuna farming that uses live fish transferred from purse seiners that produce the majority of the Atlantic bluefin catch in the Mediterranean Sea. Live bluefin caught by the purse seiners are transferred to towing pens and then again to farming pens. Therefore, conventional methods to measure the fish at landing ports has become impossible. In addition, the catch and size statistics of bluefin caught by the purse seine fisher y had been poorly estimated due to inadequate samplings and incomplete data provisions. Therefore, it is suspected that the number of fish caught and measured in the past and used in the stock assessment (official statistics) would be inaccurate and biased. 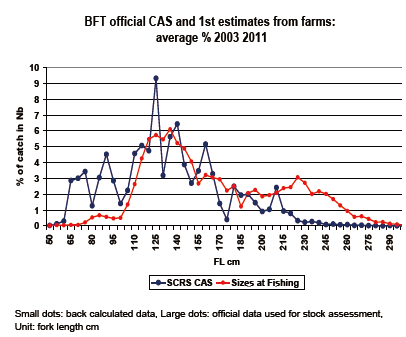 This suspicion was partly confirmed by comparing reported catch at size composition at the time of capture (official statistics) with that at the time of capture estimated by back calculating from the actual size measurements at the time of harvesting the farmed tuna (Figure, cited from A. Fonteneau, SCRS/2013/076). The comparison was made for two consecutive years when there was not much use of the SVC. The figure shows a significant difference in the length compositions estimated by the two methods, i.e., there are more small fish estimated under 100 cm based on the official statistics than those based on back calculation while there are more large fish over 200 cm in the back calculated composition than those based on the official data. This suggests the total catch in weight based on the official data is smaller than that based on back calculated data, thus, the official catch reported is underestimated. Therefore, it is inferred that the currently used catch and size data cannot be used for the assessment unless the suggested bias is somehow corrected. Then, use of the SVC has become the trump card to solve this problem as this makes it possible to count the number of fish and measure their size when the fish are transferred live into the farming pens. Although size measurements and catch reports of the Atlantic bluefin caught by the purse seine fishery have been improving in recent years, further improvement is still needed to have more accurate catch and size data. To fulfill this objective, two years ago ICCAT made it compulsory to use the SVC for fish caught by purse seiners and transferred to tuna farmers, and last year more detailed instructions were adopted for the use of the SVS in measuring the fish. The maximum size of tunnel nets used in transferring the fish from towing pens to farming pens was set (10m x 10m) and 20 % of the fish in the transfer must be measured (one fish in every five fish). In addition, the SCRS was requested by the Commission to solve other technical issues for improvement of SVC measurements. Let us briefly look at the current situation of use of the SVC in other regional fishery management organizations (RFMOs). In the Pacific, there are two management bodies dealing with the management of tuna farming, the Western and Central Pacific Fisheries Commission (WCPFC) in the Western and Central Pacific and the Inter- American Tropical Tuna Commission (IATTC) in the Eastern Pacific. Japan and Mexico are currently the only countries to operate bluefin farming in the WCPFC and the IATTC areas, respectively. Meantime, Australia is the only country which practices southern bluefin tuna farming in the area under the management of the Commission for the Conservation of Southern Bluefin Tuna (CCSBT) but I do not comment on the Australian case this time, other than urging its prompt use of the SVC, as I have already commented in the previous issue of this Newsletter. In case of Japan, when the farmers buy the seed fish, they check the healthiness of each seed. Thus, the number and size of the seed fish are accurately recorded,　Hence the use of the SVC is not required. A small portion of Japanese tuna farmers use the seed fish ranging from 2-6 kg taken by the Japanese coastal purse seiners and use the SVC for ensuring accuracy of the catch information. In the Eastern Pacific, Mexico started to report the size of bluefin measured by the SVC from this year. ICCAT has been playing a pioneer role in world tuna management. It took several steps to establish relevant measures with the SVC use recognizing that it is essential to secure the accuracy and transparency of the bluefin catch data by the purse seine fishery and used for tuna farming. Newly strengthened regulatory measures introduced last year in ICCAT are a significant step to reduce uncertainty of the stock assessment and will spread to other tuna RFMOs like the CCSBT, WCPFC and IATTC.